The combination of the wedding, and Manuel tailoring each day just for us, made for a very memorable and relaxing trip. We were on the move in a way I would typically not call relaxing. My style of relaxing is basically not having to exert large amounts of physical energy or brainpower! But with Manuel being sensitive to our needs and wants, each hiking, etc., day with Manuel and family put a lift in my step and in my heart. A year ago when Bill and I traveled to St. Kitts, I published one post per each facet of the trip. I.e., one post for animal wildlife, one post for plant life, one post for lobster, etc. I’m not that organized after Costa Rica. However, I like to keep a sort of record for my own future reference. (It seems if I don’t, a year or two later when someone wants travel recommendations, the details have already faded.) So, over time I’ll add the category of “Travel – Costa Rica” to any of my posts related to Costa Rica. Our trip was six nights/seven days. Here goes! Click once on this image to enlarge it … twice to enlarge even further. These photos, especially of the landscape, lack detail. They do show the crocodiles at one location and from one vantage point. These were taken on our shuttle about halfway between the San Jose airport and our destination, Manuel Antonio, Costa Rica. The river shown in the photos is the Tarcoles River. Another link for the Tarcoles River is here. Immediately below is a YouTube video of the same location (except actually in the river) as the photos above and also further below. The text comments on the video site include some profanity. 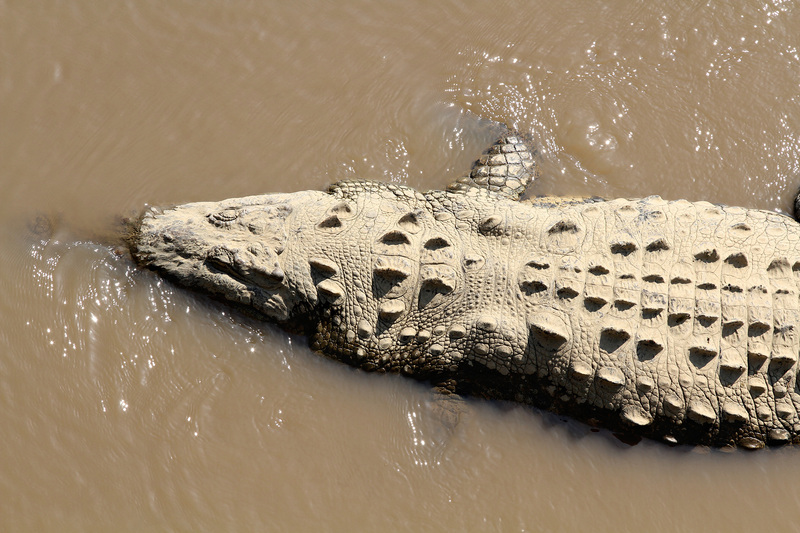 Watching the video gives perspective as to the size and movements of the crocodiles. To enlarge the photos below, and to view them as a slideshow, simply click on one of the thumbnails. Another random crocodile, but the closer I looked, the more feisty I thought it looked! (Click here to go to Louise Gunderson Shimon’s blog’s home page. This entry was posted on March 27, 2013 at 8:06 pm and is filed under Costa Rica, Travel. You can follow any responses to this entry through the RSS 2.0 feed. You can skip to the end and leave a response. Pinging is currently not allowed. Thanks for sharing. On both the ride to and from the airport to the hotel, my driver offered to stop at the tourist location to look at the crocs. Wish I had stopped. At least we get to see alligators all the time here in Florida. As a matter of fact, there is a pond right by our offices around which employees frequently take walks and see them up close as they sun on the bank. Louise, the link at “read more of this post” doesn’t seem to be quite accurate. Nice crocodile photos! Too bad you didn’t go down to the river like that guy in the video!